“Foreign born” refers to people born outside of the United States, Puerto Rico or other U.S. territories and neither of their parents was a U.S. citizen. The terms “foreign born” and “immigrant” are used interchangeably in this report. “U.S. born” refers to individuals who are U.S. citizens at birth, including people born in the United States, Puerto Rico or other U.S. territories, as well as those born elsewhere to parents who were U.S. citizens. The U.S.-born population encompasses the second generation and the third and higher generation. “Legal immigrants” are those who have been granted legal permanent residence, those granted asylum, people admitted as refugees and people admitted to the U.S. under a set of specific authorized temporary statuses for longer-term residence and work. This group includes “naturalized citizens,” legal immigrants who have become U.S. citizens through naturalization; “legal permanent resident aliens,” who have been granted permission to stay indefinitely in the U.S. as permanent residents, asylees or refugees; and “legal temporary migrants” (including students, diplomats and “high-tech guest workers”), who are allowed to live and, in some cases, work in the U.S. for specific periods of time (usually longer than one year). “Unauthorized immigrants” are all foreign-born non-citizens residing in the country who are not legal immigrants. These definitions reflect standard and customary usage by the Department of Homeland Security and academic researchers. The vast majority of unauthorized immigrants entered the country without valid documents or arrived with valid visas but stayed past their visa expiration date or otherwise violated the terms of their admission. “Immigration” to the United States includes only people who are intending to settle in the United States. U.S. decennial censuses and surveys include people whose usual residence is the United States. 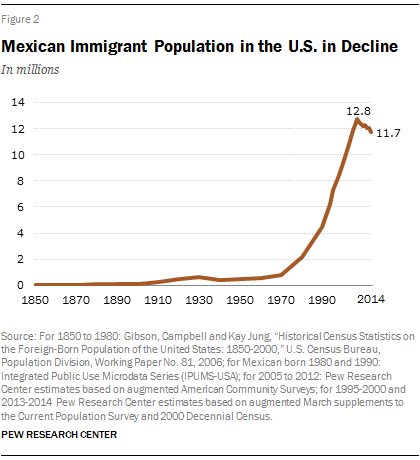 Consequently, migrants from Mexico who are in the U.S. for short periods to work, visit or shop are generally not included in measures of the U.S. population.